Fast forward to 2009, and band leader and guitarist Chris Logue set about reforming Savage Grace, and shortly afterwards Limb Records spruced up the back catalogue and made it available on CD. But unable to muster any enthusiasm from previous band members Logue hooked up with the instrumentalists of Limb Records’ NWOBHM recreationists and loveably retro rapscallions Roxxcalibur to form a wholly new line-up with which he played a number of European dates. 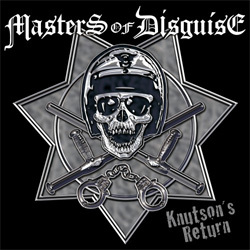 However, having written an album’s worth of material, Logue then apparently vanished, and as the guys in Roxxcalibur are never able to sit still for more than five minutes they picked up the ball and ran with it, and under the name Masters Of Disguise have become a kind of Savage Grace tribute band. With an album ‘Back With A Vengeance’ ready for release a digital download EP ‘Knutson’s Return’ featuring ‘For Now And All Time (Knutson’s Return)’, ‘Alliance’ and ‘Into The Fire’ has been issued as a taster. As with their NWOBHM work, Alexx Stahl (vocals), Roger Dequis (guitars), Kalli Coldsmith (guitars), Mario Lang (bass) and Neudi (drums) have really got into the spirit of the what was then called power metal served up by the likes of Savage Grace, Jag Panzer and numerous other young American acts. The main cut – complete with a tasteless and highly exploitative video – gives rogue cop Knutson a life of his own, and ignoring the video imagery the song itself is a not only a faithful facsimile of the Savage Grace sound but also a frenetic metal workout in its own right which showcases Stahl’s dramatic vocal range and allows Neudi to pummel his kit to within an inch of its life. ‘Alliance’ takes the pace down a tad, and pushes the guitars of Coldmith and Dequis to the fore as it throbs along, and the third cut ‘Into The Fire’ – listed as a bonus track – is an exciting re-working of a song from the band’s 1983 demo.